Is a very simple constructing Machine thus has in the extreme competitive price. 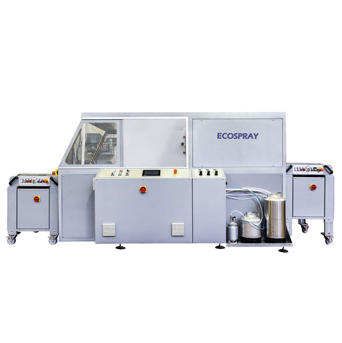 It can be supplyed with one to four spray Guns depending of needs; thus allowing to change from one Solder mask to the other in a few seconds. To change to different panel size just digit X mesure and Start. Very sharp spray shape allowing to reduce almost to zero side over-spray. Not sensitive to interruptions of production. Create functional electrical traces using conductive or other electronic elektrojet fluids on flexible substrates. In the future, electronic components and circuits will be fabricated using new organic semiconductor material and inorganic electronic fluids. Elektrojet is used efficiently and cost-effectively to produce electronic elements using functional fluids that are applied directly and without contact on to printing flexible surfaces. It does this without the waste associated with screen-based application methods. Conductive fluids and unique photovoltaic materials, both organic and inorganic, are suitable for digitally printing. 5760 x 1440 optimised DPI. Ink jet (Piezo 180 Nozzles per Channel. The perfect low-cost digital ink jet printer. 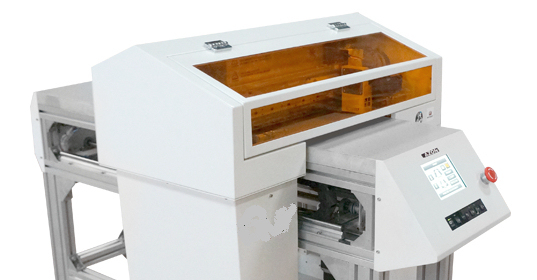 A response to the demands of the Industry for a more economical printer with a print area of 280 mm x 700 mm Smallest droplet size 1.5 pl. Colour and Mono Chrome Heads. Organic / Inorganic Mediums. Windows 7. Vista. XP.